Go team! That's what Office 2016 is built to encourage, with new collaborative tools and other ways to tie workers and content together. 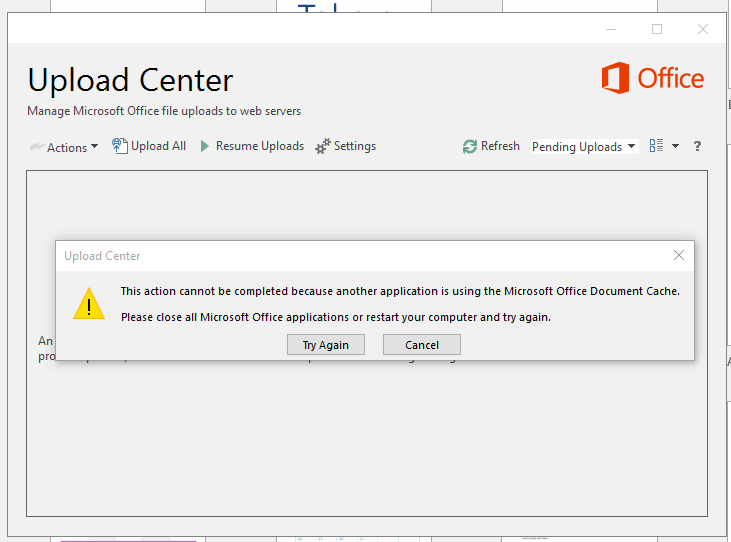 I tested the client-facing portion of Office 2016. Microsoft released the trial version of Office 2016 in March as a developer preview with a focus on administrative features (data loss protection, multi-factor authentication and more) that we didn’t test. I’ve been using it since the consumer preview release in May. Microsoft seeded reviewers with a Microsoft Surface 3 with the “final code” upon it. 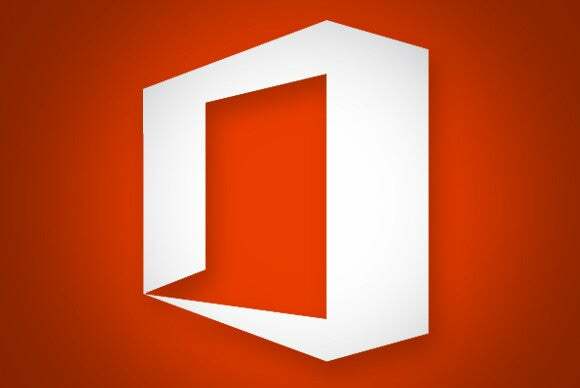 That’s a slight misnomer, as the Office 2016 apps upon it used the same version that Microsoft had tested with the public, with a few exceptions: Outlook was pre-populated with links and contacts of a virtual company to give reviewers the look and feel of Delve, Outlook’s new Groups feature, and more. 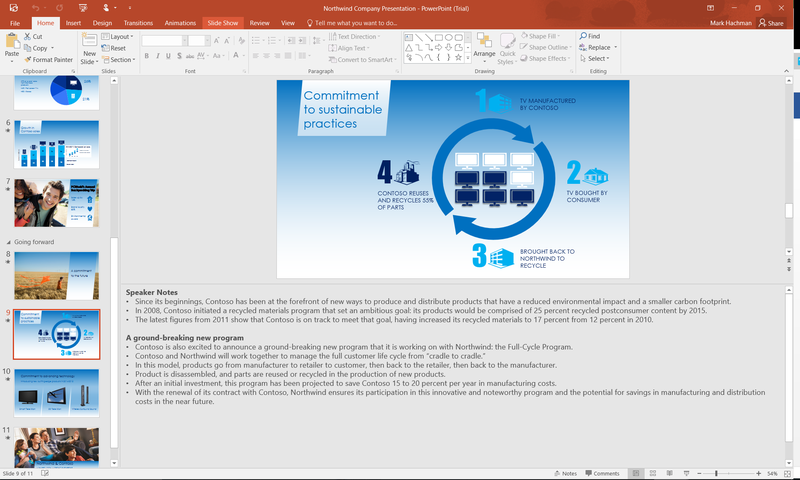 Office 2013 users can rest easy about one thing: Office 2016’s applications are almost indistinguishable from their previous versions in look and feature set. 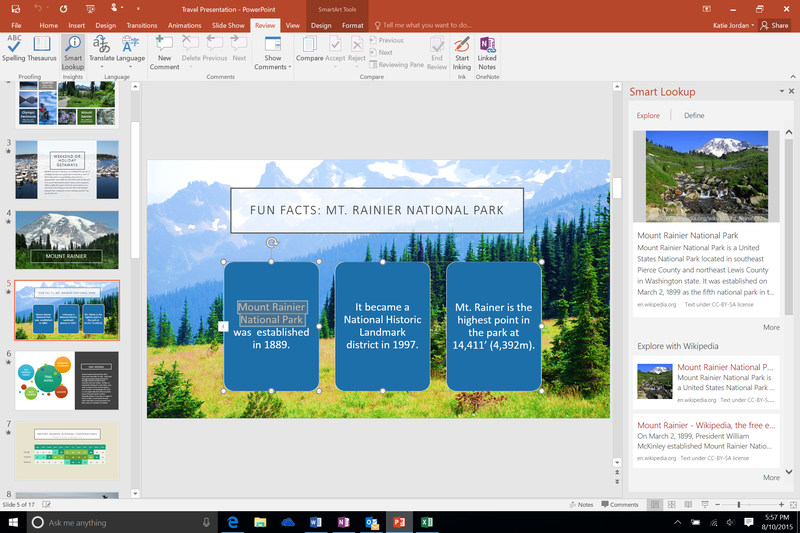 To the basic Office apps, Microsoft has added its Sway app for light content creation, and the enterprise information aggregator, Delve. Collaboration in the cloud is the real difference with Office 2016. Office now encourages you to share documents online, in a collaborative workspace. Printing out a document and marking it up with a pen? Medieval. Even emailing copies back and forth is now tacitly discouraged. Microsoft says its new collaborative workflow reflects how people do things now, from study groups to community centers on up to enterprise sales forces. But Microsoft’s brave new world runs best on Office 365, Microsoft’s subscription service, where everybody has the latest software that automatically updates over time. And to use all of the advanced features of Office, you must own some sort of Windows PC. You could still buy Office 2016 as a standalone product: It costs $149 for Office 2016 Home & Student (Word, Excel, PowerPoint and OneNote) and $229 for Office Home & Business, which adds Outlook 2016. Office 365 is $7 per month for a Personal plan (with one device installation) and $10 per month for a Home Plan, where Office can be installed on five devices and five phones. If you subscribe to Office 365, it’s a moot point; those bits will stream down to your PC shortly. Windows 10 users already have access to Microsoft’s own baked-in, totally free version of Office, the Office Mobile apps. It’s those people who fall somewhere in the middle—unwilling to commit to Office 365, but still wavering whether or not to buy Office—who must decide. My advice to an individual, family, or small business owner: Wait. If you’ve never owned Office, the free Office Mobile apps that can be downloaded from the Windows Store onto iOS, Android, and Windows Phones are very good—and include some of the intelligence and sharing capabilities built into Office 2016. Microsoft’s Office Web apps do the same. There’s no question that Office 2016 tops Google Apps, and I haven’t seen anything from the free, alternative office suites that should compel you to look elsewhere. But Microsoft still struggles to answer the most basic question: Why should I upgrade? That’s a question that I think Microsoft could answer easily—and I’ll tell you how it can, at the end. Before that, here’s what works, and what doesn’t, in Office 2016. 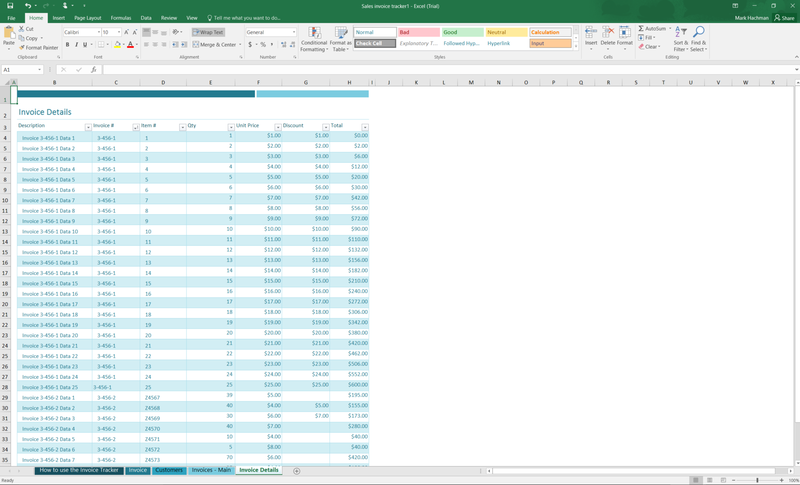 Microsoft can’t mess too much with Excel, which is the most indispensable component of Office. Entire professions essentially live on Excel as their everyday tool. The ‘Tell me what to do...’ feature cuts right through any confusion in Office 2016. The ‘tell me’ box is essentially a search box, much like Bing. But while Bing or the Smart Lookup feature adds context around the phrase in question, the ‘tell me’ box cuts through the numerous menus and submenus. If you’d like to know how to justify a group of cells, for example, you can begin typing ‘justify a group of cells.’ Excel will begin making suggestions that change as you continue typing. You can also choose to look for help on that specific topic, or do a Smart Lookup search instead. What the ‘tell me’ box does, though, is simply to do what you tell it to. That’s both good and bad, in my book. While ‘tell me’ takes you directly to a command, it doesn’t tell you where that command is located. So if you want to perform that command again, you’re none the wiser. I’ve typically thought of Excel, like PowerPoint, as an offline application. Not any more. Not only does it make more sense to post a link to an online workbook that others can use and manipulate, the complexity of these documents means emailing them back and forth simply isn’t practical. 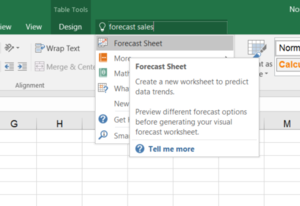 Instead of interacting with a document, Excel users now have a virtual workspace. I was also a little shocked to notice that Excel loaded only a handful of templates if I wasn’t connected. The look and feel of Excel 2016 remains largely unchanged from previous versions. Under the hood, numbers wonks are going to find lots to like in Excel 2016, with pivot tables that can handle dates, plus new charts and graphs that emphasize business intelligence—the new watchword for Excel. Excel 2016 also adds the ability to forecast results, extrapolating revenue growth, for example, a few years down the road. You’ll also find Power Query, an Excel feature that lets you pull in “live” sources of data from databases and Web pages, or your own corporate data. 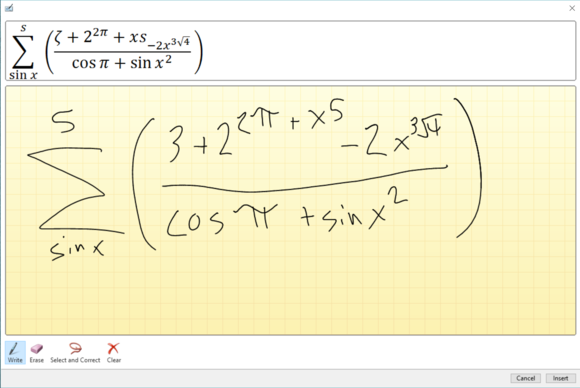 I rather like a feature that allows you to write equations by hand—handy on the Surface—although the recognition algorithm is still a little wonky. 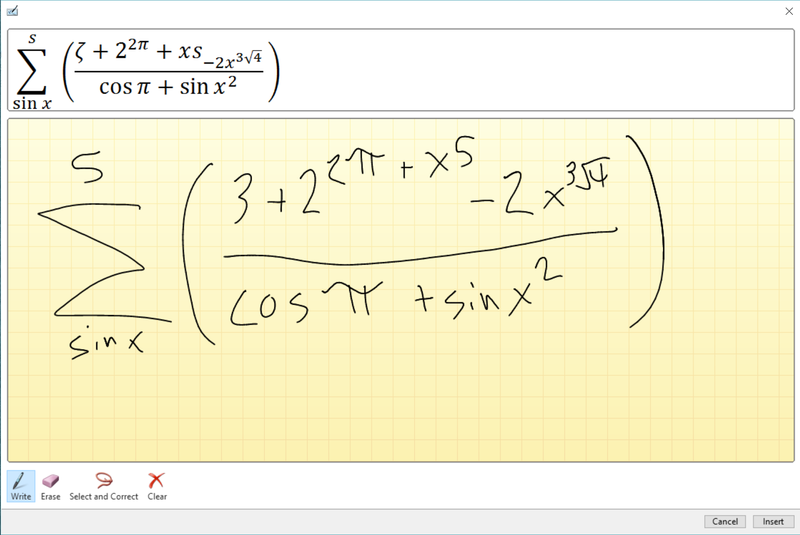 You have to write equations with a bit of care (note how Excel misinterprets the number ‘5’), but this new feature works pretty well. It learns from context, so if you keep writing it may self-correct errors. I’m not sure why Power Pivot, Power View, and Power Map—all tools that make up Microsoft’s business intelligence vision—are off by default (you can enable them in the Settings menu). It’s also not clear whether Microsoft was able to to fix a bug that prevented Power Queries from being updated on the older Excel 2013 by the release date. What you’ll probably be happy to find is a hefty number of preformatted templates that allow you simply to plug in numbers, rather than creating a template from scratch. Note that Excel (and PowerPoint) use staggered, turn-by-turn, quasi-real-time collaboration. I’m told, however, that changes are coming to each of these apps to enable Word’s real real-time collaboration. Word is the other tentpole application in Office, and it, too, is reassuringly the same for the most part. Microsoft’s particularly keen to sell users on one new feature: Smart Lookup, also known as Insights. Right-click a word or phrase in Word 2013, and a limited number of options pop up: a small formatting window, as well as options for spelling, linking the phrase, and checking grammar. In Word 2016, you get more—including options to translate the word or phrase, find synonyms, and so on. A comparison between Smart Lookup and the Wikipedia app. Note that the attribution is automatically appended via Wikipedia. With Office 2016, Smart Lookup takes the Review > Define command from Word 2013 and supercharges it. With both the old Define and the new Smart Lookup, a right-hand pane provides additional information. But whereas Define used Bing to explain the word in question, Smart Lookup provides context: the definition, plus content from Wikipedia, Bing Image Search, Bing’s Web search, and more. You can cut and paste text from Smart Lookup, or drag an image into the body of the text. It would be nice for Word to allow you to right-click and copy text from Wikipedia into your Word document; it would be even better if it automatically added it and added either a footnote or a hyperlink back to the source document. Sadly, nothing like that is available. It’s somewhat weird, then, to discover that feature in Insert > Wikipedia, a Wikipedia app for Word that was built into my preview copy of Word 2016. Highlight a word or phrase and click the Wikipedia app, and a more robust version of Wikipedia opens up. Even better, any image that appears in the pane can be clicked once to add it to the text, with attribution (and license info) automatically appended. It also searches on any text you highlight as you’re writing or editing. These are all nice touches. Not so nice is the portal to the Apps for Office store, which has not been updated for Office 2016. A lack of Office apps or plug-ins is one thing, but you still can’t see what others have said about the apps in question. There’s also a big “Trust It” button that basically serves as a warning to download plugins at your own risk. 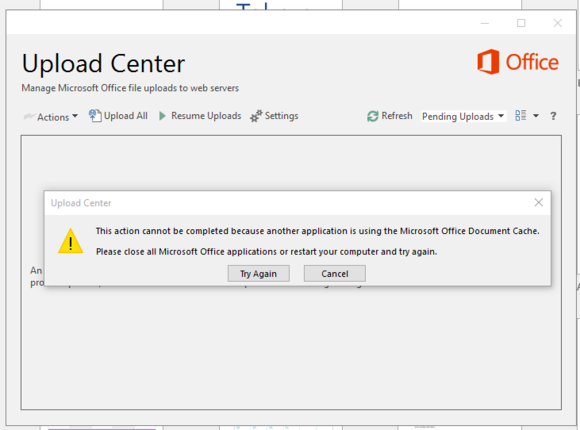 No wonder the Apps for Office store basically failed. Note that all these additional insights, however, can seriously cramp anything but a widescreen monitor. You could potentially have a document recovery pane, revision pane, Insights pane, and Wikipedia pane all bracketing your main document. On a standard 1080p monitor, however, it looked just fine. PowerPoint—the tool of most modern presentations—is an appropriate place to talk about what Microsoft is trying to accomplish with collaboration, and where it struggles. In the upper right corner of most of the Office 2016 apps you’ll see a new “Share” button, which is where collaboration takes place. For now, however, the sharing experience differs sharply between apps like PowerPoint and Word. This is how real-time collaboration is supposed to work: colleagues edit your documents on the fly, with small flags to show who’s doing what. 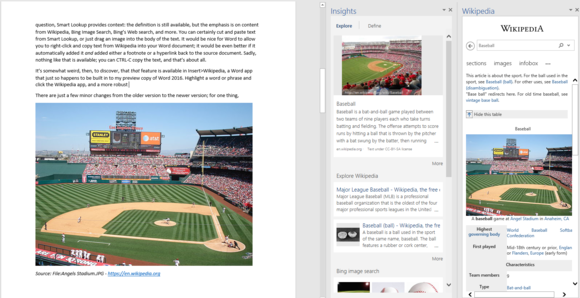 As long as all parties have Office 2010 or later versions, real-time editing can take place: Invited guests can add, edit, or delete content in a sort of collaborative free-for-all. That can be managed, however, by some relatively fine-grained editing restrictions, such as locking format changes, restricting a user to making only tracked changes, or by blocking him or her entirely (while letting other users make free, unrestricted edits). You can attach a comment to the document itself, or to a specific location in the text (which then shows up as an icon). You can also manually save whenever you’d like to create a version history that helps organize the document further. Even if you’re offline, you can still monitor progress using Track Changes. PowerPoint 2016 looks almost identical to PowerPoint 2013. Next page: Where PowerPoint falls short, and OneNote's new approach. Microsoft adds two new apps to Office 2016: Sway and Delve. But while Microsoft's newfound focus on collaboration makes real sense for businesses, home users should also consider Microsoft's free, excellent Office Mobile apps for mobile devices.